The Sages Call it by Different Names"
An introduction to the Buddhadharma. "The eating of meat extinguishes the seed of great compassion." "It is strange to hear people talk of Humanitarianism, who are members of societies for the prevention of cruelty to children and animals, and who claim to be God-loving men and women, but who, nevertheless, encourage by their patronage the killing of animals merely to gratify the cravings of appetite." "Animals are my friends...and I don't eat my friends." 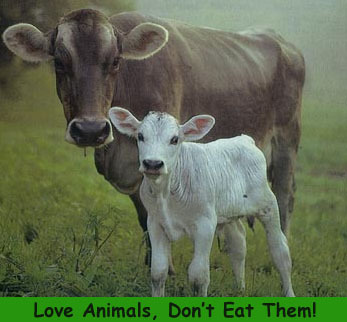 "People often say that humans have always eaten animals, as if this is a justification for continuing the practice. According to this logic, we should not try to prevent people from murdering other people, since this has also been done since the earliest of times." "If slaughterhouses had glass walls, everyone would be vegetarian. We feel better about ourselves and better about the animals, knowing we're not contributing to their pain." "A man can live and be healthy without killing animals for food; therefore, if he eats meat, he participates in taking animal life merely for the sake of his appetite. And to act so is immoral." "To my mind, the life of a lamb is no less precious than that of a human being. I should be unwilling to take the life of a lamb for the sake of the human body." "My dream is that people will come to view eating an animal as cannibalism." "There will come a time when civilised people will look back in horror on our generation and the ones that preceded it: the idea that we should eat other living things running around on four legs, that we should raise them just for the purpose of killing them! The people of the future will say "meat-eaters!" in disgust and regard us in the same way we regard cannibals and cannibalism"
"The animals you eat are not those who devour others; you do not eat the carnivorous beasts, you take them as your pattern. You only hunger after sweet and gentle creatures who harm no one, which follow you, serve you, and are devoured by you as the reward of their service"
"There will never be peace as long humans murder their own children and eat their fellow creatures." No, Only the Eternal Knows! Stop Judging! "Whosoever honors his own religion and condemns other religions, does so indeed through devotion to his own religion, thinking 'I will glorify my own religion.' But, on the contrary, in so doing he injures his own religion more gravely. So concord is good: Let all listen, and be willing to listen to the doctrines professed by others." --The Buddhist Emperor Asoka of India, 3rd Century B.C. This entire domain is Copyrighted 1997-2017. All are rights reserved. Do not duplicate or redistribute in any form anything on this domain without express written permission. Brief excerpts excepted. You are warmly invited to link to this site as long as you host the graphics on your server.